As you probably already know, Knowify covers a wide swathe of a contractor’s day-to-day business administration activities. But it doesn’t do everything – if it’s not job related, then Knowify may not address it. Would you like to use Knowify to help you with job costing and contract management, but wish it included a lead tracking or marketing side? Or perhaps you wish you could have your Knowify activity broadcast across your communication platform (like Slack), ensuring that everyone remained up-to-date on the activities of the business. We share your vision of end-to-end business automation, with modern software tools helping you to grow efficiently and intelligently, each one passing essential information to the others to ensure that your organization is a well-oiled machine. Each contracting business is as unique as the jobs it takes on and the customers with whom it interacts. It was important to us at Knowify that we be able to support our many different contractors with an electronic payment solution that was as flexible as their businesses, including e-check/ACH and even credit card, when appropriate. Not all contractors should accept credit cards, and even those that do should not accept them for all jobs (see below! ), BUT… there are times when offering a customer the ability to pay with a credit card can be very helpful to the contractor, and thus something we wanted to support. It’s an annoying truism for any trade contractor: your vendors expect you to pay on time, every time, while your customers don’t feel the same urgency when it comes to paying you. It’s doesn’t take a CPA to see the potential problem here: if vendors need to be paid now, but customers are taking their sweet time, you can run into some pretty serious cash flow problems. And, heaven forbid you’re a smaller-size contractor who finally landed a game-changing big job, those cash flow pains can actually start to threaten the health and viability of your whole business. It doesn’t have to be this way. Especially in that “big job” case, your counterparties are very likely to pay – nobody wants a mechanics lien on their property – and your contract with them leaves very little uncertainty as to what you’re owed. Recently, a number of really great services have emerged to help small contractors manage the cash-flow lumpiness of their businesses. Their services are generally quite inexpensive relative to other alternative financing sources, and are very easy to take advantage of – provided that you’re using the right sort of technology to enable them. As part of our December “Integration Month” series, we would like to introduce you to some of the integrations we’ve built to help our contractors connect their Knowify to useful services in a seamless way. From short-term funding to electronic payments to zapier-mediated CRM connections, we are putting a lot of effort into trying to help our users run their businesses more efficiently and get the most out of their Knowify experience. We’d like to begin the series with our very first integration, which remains our most important one: Intuit’s QuickBooks and QuickBooks Online. It’s become an accepted truism among economists and high-end business consultants: what you measure is what you get (see HBR Column: You are what you measure). It may sound complicated, but it’s not; the core concept is that your employees will do more of whatever you measure in terms of performance (especially if there are $-related consequences! ), and less of whatever you don’t. So – what are you measuring in your business? And are you sure you’re measuring the right thing? Here at Knowify we are always looking for ways to help you save time and make money faster. We know that the key to saving time is quick and easy communication. Our priority is to make communication easy both internally between you and your team and externally between you and your clients. It is likely that you will have lots of communication with your customers throughout the span of each job. One of the most critical interactions that you will have is the communication around the client signing your bid. Very simply, without a signed bid there is no job to work on. Taking advantage of our E-Signature portal will help you with getting jobs signed and getting them signed faster. 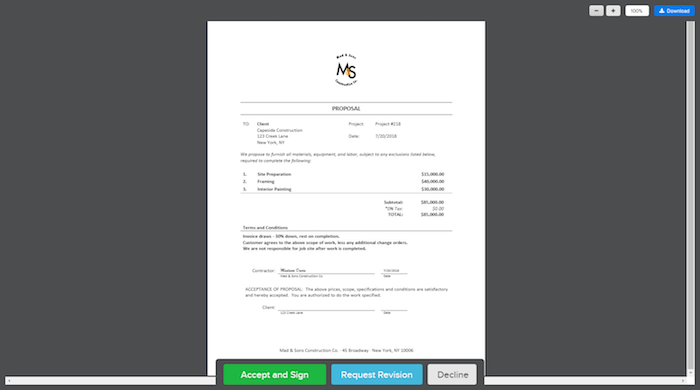 Using our E-signature portal and sending your bid through email puts you one step ahead of the game. Customers are more likely to sign a bid with someone they see as professional and efficient. Having a clean looking proposal that is up to date with technology – really, who uses paper these days? – will impress your clients and give them confidence that they are choosing the right company to trust with their job. This week we are taking a break from our “Feature of the Week” to highlight the most important features and settings when getting started with Knowify! Onboarding Knowify is an important process. It can be fun, and even therapeutic, organizing your business to fit into our system. When adding a new user to your Knowify account you are presented with many options to choose from in order to set up their permissions and access to Knowify. Selecting the correct options will ensure that your users are set up with only permission to access the parts of your Knowify account that you would like to grant them access to. Busi­ness own­ers are often con­fused by the term “busi­ness soft­ware” or “busi­ness man­age­ment soft­ware,” so here is a brief his­tory of how busi­ness soft­ware came to be, what it is today, how it can help your business. At the core of every busi­ness has always been its gen­eral ledger. As you prob­a­bly know, entries used to be recorded by hand before 1961 when the first large-scale com­put­er­ized account­ing sys­tem was intro­duced by IBM. This sys­tem was called 9Pac, and it was one of the first sys­tems to track the sales of every sales­per­son in a company. With your team all onboarded to Knowify , communication is so easy! We provide many ways for you to communicate with the rest of your team and for them to communicate with you. You can connect with your team through comments on jobs, uploading photos, scheduling, and push notifications.